There are almost as many devices for finding hidden bugs on the market as there are surveillance devices you can install yourself. This makes it very tempting to cut costs and undertake sweeping for hidden cameras by yourself. However, there several reasons why you should avoid this course of action. Fear and panic are often the first two reactions to finding a hidden camera in your home. Your initial thought may be to rip out any device you find and run to the shops to purchase a device to find any other hidden cameras and alike around your home. However, if you follow this path you will put yourself in more danger and lessen the chances of ever finding out who placed the devices in your private space. Not only does this course of action risk letting the perpetrator know that they have been found out, but bug sweeping your home by yourself risks missing out valuable clues, and even potentially leaving bugs unfound. Take control of your emotions and instead take a more productive course of action by contacting a counter surveillance expert. By doing this, you will firstly get support and advice throughout the course of the investigation. Secondly, the sweep of your home will be more thorough and less likely to cause alarm or miss anything. Not only are they likely to have better equipment, but also they have been trained on how to use it effectively. In addition, a professional private investigator will be able to give you advice on minimising your future risks and compile a security report that will aid you in any further action that you take against the perpetrator. Hire surveillance experts from Advanced Sweeping for a high quality service at an affordable price; while sweeping for hidden cameras we will also check your premises for other hidden bugs. 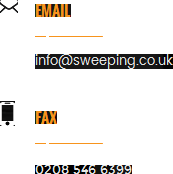 Call us today on 0845 512 1552 from a secure line away from home, or browse through the website http://sweeping.co.uk/ to see what we can do for you.